Custom made engagement rings and more! J.F. 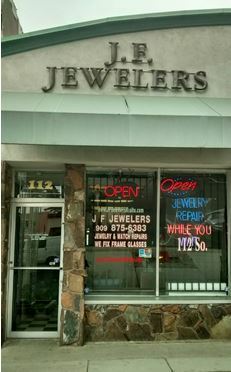 Jewelers was established in 1999 in Rialto, CA. Our Fine craft Jeweler has over 40 years of experience in all phases of Jewelry Manufacturing and Repairs. Our experienced Jeweler hand makes custom gold jewelry to specification using various tools and machinery. We have knowledge of semi-precious stones. We treat every piece as unique as their owner. We Repair Gold & Silver Jewelry. All repairs should be done by an expert. J.F. Jewelers is the perfect repair shop that has a skilled professionals with profound knowledge of the domain of Jewelry Repair. Jewelry Service at affordable prices. Jewlery Repair While You Wait! Copyright 2016 J.F. Jewelers. All rights reserved.